Chemical peels involve a process of applying a chemical solution to the skin which, after a day or so, begins to peel/slough off. This process can be used on the face, neck, chest, hands and even for the entire body. After the skin loosens and falls away, new skin is allowed to appear from underneath. The removal of dead skin cells stimulates the production of new skin cells. You will see a dramatic difference in skin color, texture and tone. The skin feels softer, smoother and has a very healthy glow to it. The peel creates an even and controlled shedding of damaged skin cells. For people at high risk of skin cancer, a light chemical peel twice a year is a great way to keep skin cancer at bay. They are also very helpful for individuals with skin blemishes, wrinkles, acne scars and uneven skin pigmentation. Chemical peels can be used on ALL skin types and conditions! Chemical Peels give a whole lot of BANG for the BUCK! *You may require 3-6 peels to get your face , neck, chest, etc.. right where it needs to be (ie where you are happy! ), but after that, just 1-2 per year is all that is required to look and feel terrific! You should very much consider our peels for any skin conditions you are experiencing! They don’t disappoint! Some peels are medical grade (PCA Skin, DMK) and some are a little lighter (Image Skincare), but all are very effective. Your skin will peel or slough only what it really needs to pull out. *You can experience peeling for only 2-7 days. However, if you do not see any visible flaking or peeling it doesnt mean the peel isn't working. Additionally, we give you a take-home aftercare kit which really accommodates any sloughing needs your skin may need. A $25-$50 post peel kit that is complimentary with every peel. PCA, Image, DMK or a combination will bring amazing results! All our Chemical Peels are performed by our owner Christal Petrak, a licensed and"certified" professional with over three decades of experience working with extreme acne, pigmentation. aging and ethnic skin . Professional consultation and home care is recommended prior to any chemical peel or paraMedical treatment. Call 562-427-1025 to schedule a consultation. We will analyze your skin before recommending treatments that are suited for your skin type and individual needs. Whether you struggle with acne, rosacea, sun damage, wrinkles or scaring, we have the most advanced products & technologies available to give you results! *We have seen amazing results with 3-5 peels for lifting pigmentation and melasma. These are darkening patches of skin that only continue to darken and increase over time. We are lifting the pigmentation off your face in the form of peeling (sloughing). From there, it’s ultra important for you to use SPF 30+ every day to protect your results and keep it from coming back. Combinations of glycolic, retinol, resorcinol, hydroquinone, salicylic and lactic are bringing real results. Yes, fine lines and wrinkles can be lifted and diminished significantly. Depending on the depth of your wrinkling is dependent on the number of peels necessary. We always like to start with a series of 3 and go from there. Sometimes it only requires 3; sometimes a few more, but yes we can get there. And again after peeling, SPF becomes your friend and is needed to protect your results. Combinations of glycolic, retinol, salicylic, enzymes, plant stem cells, peptides are bringing real results. You guessed it we will customize your peel with combinations of all the ingredients we use for pigmentation lifting and acne. Additionally may recommend the first in your series to include 20 minutes of micro dermabrasion to resurface your top layer as well. Yes, again *we will recommend starting with a series of 3 peels. Do you have persistent redness or even been diagnosed with rosacea? Believe it or not, the right chemical peels can definitely help with that. We use a combination of ingredients to help diminish your redness dependent on if you are more sensitive or less sensitive. Typically however enzymes along with Vit C are introduced. From there the proper serums are used to build the strength of your skin back up. Lots of antioxidants, stem cells, peptides are fed deep into the layers of your skin to reduce redness and bring real results. And again, *we like to start with a 3 series and go from there. A Note about our Peels: Not all peels are alike! We chose the gold-standard and industry leaders in order to bring our clients the best that the peel industry has to offer. 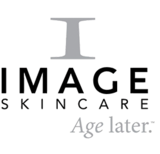 DMK, Image Skin and PCA Skin have been the gold-standard in chemical/facial/body peels and they require special training and certification in order to utilize their peels. Certification with chemical peels is very important due to how powerful they are and yes, we are certified to use their peels and product line. With peels, experience and certification matters! We offer: DMK PR Peel, Image Peels, TCA Peels & Enhanced Jessner Peels (from 1 to 6 layers) – some medical grade, some a little lighter. What to Expect: We will determine which peel series will work best for you once we have a consultation and perform a skin analysis. 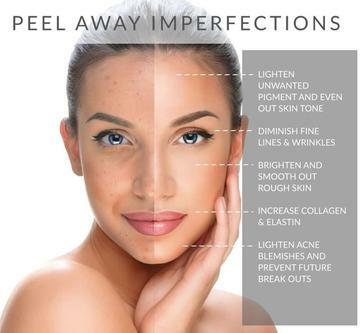 Everyone’s needs are different and many times peels are custom created specifically for you making everyone’s peel treatment unique. And… additionally, we treat your skin right with layers of corrective serums added directly over your peel allowing these power-packed ingredients to work their way deep into your skin/tissue layers. Lastly we follow it all up with a lip therapy treatment that is oh-so delightful! There is no additional charge for corrective serums, lip therapy or even for the number of peel layers put on your skin. Peels are most effective in a series of 6-12 sessionas depending on the severity of the condition. Ask about our membership for discounted pricing! **Each peel comes with a free take-home post peel treatment kit ($25-$50value) – allows for 5-7 days of morning and evening skin care. Service expected purchase frequency/quantity: Chemical peels are typically scheduled in a series and we will give you a free take home treatment kit as well as a broad spectrum sun screen after every peel service. All peel procedures are carefully explained and build in time and strength with each recurring service for optimal results. Once you complete a series of peels, we recommend just 1-2 per year. In a chemical peel, a chemical solution is applied to the skin and allowed to soak in. Over the next 1 to 14 days, depending on how deeply the chemical penetrated the skin, the layers of the skin peel and slough off. This procedure dissolves layers of the skin in a controlled way so that new skin can grow in its place. The chemicals used are sometimes called exfoliating or wounding agents. · Level 1 - Superficial peels are the mildest type of chemical peel and can be used on all skin types. Superficial peels usually use liquid containing a mild (dilute) acid, most often glycolic, lactic or salicylic acid. · Level 2 - Medium peels penetrate the skin more deeply than superficial peels and cause a second-degree burn of the skin. Trichloroacetic acid (TCA) is the main peeling agent used for medium peels, though the peel may also be done in several steps using a different chemical solution followed by TCA. · Level 3 - Deep peels penetrate several layers of skin and cause a second-degree burn of the skin. They are used only on the face. A chemical called phenol is usually used for a deep peel. Deep peels may not be used on darker skin types because they tend to bleach the skin (hypopigmentation). Even in lighter-skinned people, phenol peels-or any type of deep resurfacing-may hypopigment the skin. A deep peel is only done with prior consultation and proper skin preparation. A consultation will help your esthetician decide what depth of peel and what type of chemical solution is most appropriate, based on your skin type, which areas you want peeled, what kind of results you want, how much risk you are willing to take, and other issues. A small "test spot" may be peeled to get a better idea of the results, especially for people with darker skin. One to three weeks before the peel, you will need to begin preparing your skin by cleansing it twice a day, applying a special moisturizer or cream once or twice a day, and using sunscreen every day. In some cases, daily use of Retinol (vitamin A), or a topical acne medicine is also recommended and may speed healing. Your esthetician recommended home care regimen will help the skin peel more evenly, speed healing after the peel, and may reduce the chance of infection and other complications, especially uneven color changes in the skin. For medium and deep peels of the face, you may need a short course of medicine (such as acyclovir) to prevent viral infection. This is especially likely if you have had cold sores before, and the peel will be in the areas near the mouth or eyes. Right before the peel, the skin is cleaned. The chemical (usually a liquid or paste) is then applied to the skin with a small brush, gauze, or cotton-tipped applicators. The chemical is left on the skin for several minutes, depending on the type of chemical used. Water or alcohol may be used to neutralize the acid and end the chemical reaction, then it is wiped off. You may feel a little itching or slight burning while the chemical is on your skin. A handheld fan can help cool the skin and relieve any discomfort. The technique used to do a medium peel is similar to that used for a superficial peel, but the chemical may be left on longer and multiple layers are applied. The esthetician may choose to increase the effectiveness of the peel by performing pre-exfoliation with another peel or microdermabrasion. Medium peels can be more painful than superficial peels, because the chemicals are stronger and they soak deeper into the skin. You may be asked to take a mild pain reliever and an oral sedative to reduce pain and anxiety before the procedure. Cool compresses and fans are used to cool the stinging caused by the chemical. There is little or no pain after the peel is finished. Home care products to speed up healing and reduce inflammation are highly recommended for best results. Deep peels take the most time and will require some downtime after the peel and you will have a substantial amount of peeling or shedding of the skin. It is impossible to tell how much a patient will peel but 5-7 days is the average. Most deep peel solutions contain a numbing agent and the peel is virtually pain free. Some mild stinging may occur when the peeling solution is applied. This type of peel is NOT neutralized and it is left on the skin. Immediately after the peel you may have swelling, redness and/or irritation. A mild pain reliever or anti-inflammatory may be taken 30 minutes before the peel. Estheticians who perform our deep peels have gone through extensive training and will have many years of experience performing chemical peels. The procedure for a deep peel using phenol can be more complicated than other types of peels. Only experienced professionals should perform this type of peel. · Cleansing morning and night with a gentle skin cleanser recommended by your skincare professional. · Frequently applying a healing ointment on the skin (for medium and deep peels). · Moisturizing the skin morning and night with a recommended product. · Avoiding any sun exposure until peeling has stopped and frequently apply a non-irritating sunscreen. New skin is more susceptible to sun damage. · Avoid picking and peeling the skin during the healing as if my cause skin damage and pigmentation. Superficial peels are done quickly with little or no down time and cause only slight discomfort afterwards. Most people can return to their normal activities immediately. The skin heals quickly after a superficial peel. The skin may turn pink, and only minimal peeling may or may not occur. Medium peels may need to take a few days off work to recover. A medium peel causes a second-degree burn of the skin depending on the layers of the peel applied. The skin usually takes 5 to 7 days to heal and may consist of mild to moderate peeling and some redness. There is little or no pain after the peel, but there may be some swelling, especially if the area around the eyes is treated. The skin will turn reddish brown in 2 to 3 days, become crusty, and then flake and peel over the next few days. A deep peel causes a deeper second-degree burn of the skin. Skin regrowth takes between 10 to 14 days after a deep peel. The skin can remain extremely red for up to 2 weeks for some people. Most people take about 5-7 days off from work. Complete healing of the skin may take several weeks. · Oral pain relievers may be taken to reduce pain and swelling after the peel. · Some people have severe swelling, especially around the eye area. Elevating the head may reduce the swelling to some extent, and corticosteroids may be used for more severe swelling. · Proper wound care is extremely important after a deep peel to speed healing and prevent infection of the wound. You may be asked to apply a healing ointment several times a day to reduce crusting and speed up the healing. It’s important to return for a follow up hydrating or deep cleansing treament 1-2 weeks after the peel to make sure the skin is healing properly and to treat any conditions that may come up. · Recently used isotretinoin or Accutane (drugs used to treat acne) in the past 6 months. · Are pregnant or lactating. AHA’s may be ok in the 3rd trimester with your doctor’s clearance. · Had recent facial surgery or facial radiation therapy. This can make regrowth of the skin more difficult. · An active herpes infection affecting the area to be treated. · An impaired immune system. This can delay healing and increase the risk of infection and skin color changes after the peel. · Known allergies to certain medicines. The results of a chemical peel depend in part on the depth of the peel and the care of the skin afterwards. We recommended at least a series of 3 peels to achieve a significant difference in the skin’s appearance. It is important that your skincare professional understand what you hope to achieve and that you understand what results you can realistically expect. Even with realistic expectations, you may not see results for several weeks or months after a chemical peel. · A superficial peel may slightly reduce but does not eliminate sun damage and signs of aging. The results may not appear for some time, and when they do appear, they may be minimal. Repeated peels and a series of 6 or more over several months or years are often needed to produce the desired results. · A medium peel can be very effective in evening out pigment differences and in reducing fine wrinkles and signs of sun damage. Retreatment may be needed after 2 to 4 weeks to produce the best effect. · A deep peel can help eliminate wrinkles and significantly tighten the skin. The effects are often dramatic and increase over time as the skin produces more collagen with the wound healing. In general, a person can have repeated deep phenol series of peels only 1-2 times a year. Your skin type, skin care before and after the peel, and your lifestyle after the procedure can also affect the results. Some types of skin problems respond better to chemical peeling than others. People with lighter skin who limit their sun exposure after the procedure tend to have better results than those with darker skin and those who continue to spend lots of time in the sun. Before you decide to have a chemical peel, talk to your skincare professional about the kind of results you can expect and if those expectations are reasonable and achievable. You may be referred to a plastic surgeon if the wrinkle depth or scarring will not have the desired effect by a chemical peel. Changes in the color and texture of the skin caused by aging and sun exposure may continue to develop after a chemical peel. Chemical peels are not a permanent solution for these problems and the skin requires ongoing maintenance for skin rejuvenation. In general, the deeper the peel, the greater the risk of side effects and complications. · Redness (erythema). Expect some redness of the skin after a chemical peel. With deeper peels or with certain skin types, redness can be severe. It may fade within a few days, or it may last several weeks. · Color changes in the skin. Treated areas may be darker or lighter than the surrounding skin. · Swelling (edema), especially around the eyes. · Allergic reaction to the chemical. · Infection. People who have a history of herpes outbreaks are especially prone to infection after a chemical peel. · Increased sensitivity to sunlight. During the early healing period after a chemical peel (before the skin has finished peeling), you will need to completely avoid direct sun exposure, especially after a deep peel. After the early healing period has passed, you will need to wear sunscreen every day and limit sun exposure as much as possible. New skin is more susceptible to damage and discoloration from sunlight. The skin will absorb all sunscreen after 2 hours, so it is important to reapply sun protection frequently after a peel. We recommend a high quality mineral makeup such as Colorscience or Jane Iredale to reapply throughout the day for adequate protection. Chemical peel, microdermabrasion, and laser resurfacing are the most commonly used techniques for improving the texture and appearance of the skin. Although these techniques use different methods, they have basically the same effect on the skin-they destroy and remove the upper layers of skin to allow for skin regrowth. No one technique is necessarily better than the others. When done by an experienced surgeon, laser resurfacing may be slightly deeper than chemical peeling or dermabrasion but can be painful, extremely expensive and requires several treatments. It has higher risks and can have adverse affects and may cause more pigmentation and scarring, especially in ethnic or darker skin types. But the choice of technique is based on the site you want to treat, your skin type and condition, your preferences, and other factors. Some people may get the best results using a combination of techniques.